"I'm an ape man, I'm an ape-ape man, Oh I'm an ape man. I'm a King Kong Man, I'm a voodoo man, Oh I'm an ape man." Like to have your mind boggled? Want to choose the pill that makes you see through the illusion? 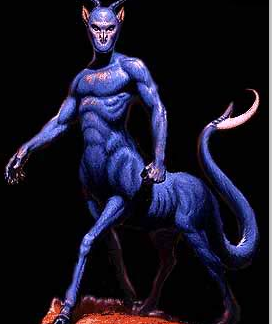 Here is the source for some of my thinking on the origins of centaurs and other manimals: the author, Zecharia Sitchin. If you are a closed-minded and highly conservative, logical thinker, you probably won't want to explore the realm of extraterrestrial influences. If not, check out the wonderful weirdness of Mr. Sitchen's work. In The 12th Planet (1976), describing the Anunnaki's genetic engineering to fashion The Adam, Zecharia wrote: "Man is the product of evolution; but modern Man, Homo sapiens, is the product of the 'gods'. For, some time circa 300,000 years ago, the Nefilim took ape-man (Homo erectus) and implanted on him their own image and likeness." In The Earth Chronicles Time Chart (The Wars of Gods and Men, 1985) Zecharia wrote: 300,000 years ago: The Anunnaki toiling in the gold mines mutiny. Enki and Ninhursag create Primitive Workers through genetic manipulation... Homo sapiens begins to multiply." Not the exact quote I need, but close. Imagine extraterrestrials landing on Earth in search of suitable candidates to genetically modify and turn into worker drones for slave labor in the mines on their home planet. Wow, that is so far fetched you say. Now imagine that they succeed in creating a hybrid by mixing their genes with those of the hominid inhabitant of Earth Circa 298,000 BC. Viola! Modern ape man AKA Homo sapiens--Us! Too much to wrap your brain around? 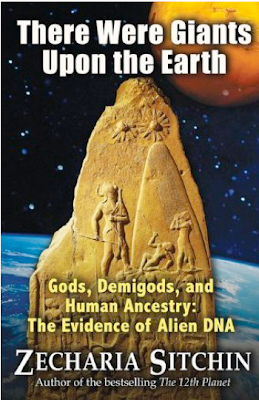 Read Sitchin and discover a whole new way of thinking about God and the origins of modern man. Thanks again, Anadae. I will be sure to investigate The Secret Sun blog. I dream that, perhaps in the not so distant future, we will be able to have strong comment threads here, too.